But deaths from the disease have fallen by a fifth since 1989 to 12,417 due to better treatment and earlier detection. Experts said the rise in cases was being fuelled by lifestyle changes and the start of national screening. Factors such as obesity and drinking alcohol are known to increase the risk of a woman getting breast cancer. The ageing population is also a factor, but this was taken into account by ONS statisticians when compiling the figures. But Mark Matfield, scientific consultant for the Association for International Cancer Research, said the fact that women were having smaller families and breast-feeding less also played a part. "It is hard to pin down exactly what has caused this rise. These lifestyle factors are having a significant impact, but so has the introduction of the national screening programme in the late 1980s. "Better nutrition also mean the age of the first period is falling and this increases risk later in life. "It is a complex picture." Sir Richard Peto, a cancer expert at Oxford University, warned against reading too much into the rises in the number of cases. "Incidence is not reliable, it fluctuates depending on how well you measure it and record it. "The thing that matters most is the decreases in the deaths." And Dr Lesley Walker, of Cancer Research UK, advised women of the precautions they could take to reduce the risk of breast cancer. "A balanced diet and regular exercise can help women maintain a healthy weight which lowers the risk of several common cancers. "Over the age of 50 women should ensure that they go for breast screening when invited. "Women should also be aware of any significant family history of cancer and keep their doctor informed." 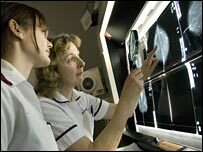 The figures also showed that breast cancer accounted for one in three newly diagnosed cases of cancer in females. Bowel and lung cancer where the next most common. For men, prostate cancer was the most common, accounting for 25% of the total number of cancers. Lung and bowel cancer were the next most prevalent. Prostate cancer in particular has shown a sharp increase since 1990, doubling to 98 cases per 100,000 due to better testing methods.